- 2 teddy bears, one for their child to keep in the coffin and one for the family to keep. 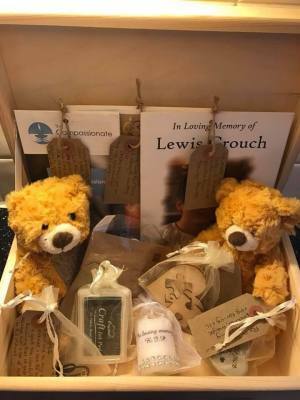 - The memory book that we made for Lewis’s funeral, instead of an order of service we had everyone read wonderful memories of Lewis. We’ve included this to let families know that there are no set rules or regulations when it comes to a child’s funeral. You should do whatever feels right. - Small trinket box to keep a lock of their hair, or sentimental jewellery with the family forever. - A kit to take thumb and handprints from their child. - 2 Amethyst stones, a stone that is believed to help grief. One for the child to keep in their pocket, one for the family. - A candle to light in memory of the child. - A jigsaw piece out of a heart shape to represent the piece missing from the family’s hearts now. - A booklet from The Compassionate Friends, a charity and support network that helps newly bereaved. - A selection of other lovely items to keep at home, send with the child, or do whatever feels right. Each item comes with a tag, explaining the potential uses and how they helped our family. 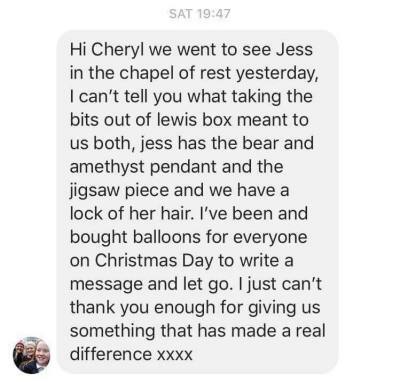 When a child dies suddenly, little things like this really matter- because they provide a way to keep them in our lives forever even though they’re gone.